We understand that it is difficult to order the dress in front of a computer screen. So we have prepare the fabric sample to simplify the process. Please select the type of the material in the drop down list. 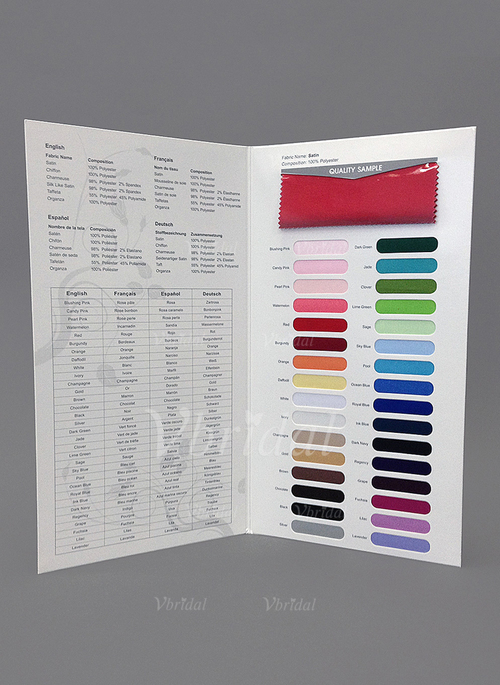 The fabric sample has all the 32 colors. It also includes a piece of fabric (13 cm * 6 cm) in red color extra so that you can feel the texture of the material. The Fabric Sample can be immediately sent out after your order is confirmed. I ordered a fabric swatch in chiffon and was pleasantly surprised when it arrived five days later (I chose Standard Shipping which says it takes 5-8 days to Australia). The colours are fairly true to those on the website, although those online are brighter (from a backlit screen, I expect), and the fabric quality is nice too. The chiffon is very soft without being silky. 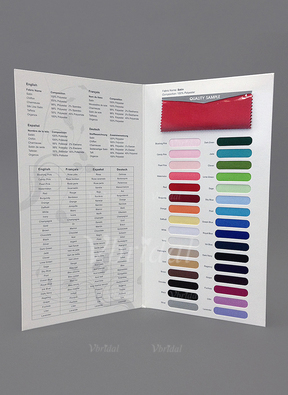 The individual colours are about 1cm by 4cm, but the red swatch at the top is large enough to see fabric quality. I would recommend a fabric swatch to anyone who has doubts about the colour of dress they wish to purchase.